A logo is much more than a flashy symbol or a fancy-looking name. Your logo is the physical representation of your brand identity. Like a flag or a coat of arms, it shows what’s important to your company, what sort of style you have, and what sort of ideas you are promoting along with your products. A logo is a symbol or design a company chooses to tie to its identity. Think of a literal brand that might be used on cattle. Farmers brand cows with a piece of metal designed to show that the cow belongs to that farm. If anyone comes across a cow with that brand, they know exactly where it came from. Logos are stamped everywhere: on billboards, hats, trucks, shirts, and buildings. When we see a logo, we should know where it comes from. For instance, think of the Nike swoop. We see that symbol and know that the product is from Nike, even if “Nike” isn’t printed next to it. Take a second to think of some of the most famous logos you know. What are they trying to say? Have you noticed that Amazon’s logo has a smile underneath it? Or how simple and clean the Apple symbol is? Domino’s Pizza logo simultaneously looks like pizza and domino pieces. Genius, right? Our logo at ZipBooks contains a line of books to show our bookkeeping, but it also looks like a zipper because we are the fastest online accounting software company around. Are you stuck with your logo design forever? With all the hype about logos, it’s important to realize that you are not forever stuck with the first logo you choose. Most large companies have a lot of money to hire experienced graphic designers to create their logos. 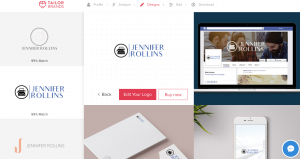 Smaller, younger companies don’t usually have the funds for that, so if you want to create a placeholder logo now, you can definitely change it later if you don’t like it. Like we said before, getting professionals to design your logo can be pretty pricey. But that doesn’t mean that you have to go without a logo until you can get the funding. There are plenty of software developers who have created easy programs to help you design your own logo. We’ll walk you through them so you can find the perfect one for your business. We’re including how to use the site, the pros, the cons, and an example from each. Search for a symbol related to your brand identity. Select an icon from the menu and click on it to choose the color, size, and position. Add a tagline if you want. SquareSpace is beautifully designed and pretty easy to use. They have a pretty great range of icons. You can make a lot of customizations to the font and color. Over all, it is the cleanest and most professional of the designs. The downsides? You can get a free watermarked low-res 360 X 400 version of your logo, but unless you are a SquareSpace member it costs $10.00 and you don’t necessarily have sole rights to your logo. Describe your business so they can tailor a design to you. Then you can pick between three logo types: icon based, letter based, or initial based. Then you click through the examples you prefer so they can design your logo to fit your preferences. They will match you to a few designs that you can choose between, but you can also edit them once you select them. Tailor Brands is nice because you have expert designers who will fit your logo exactly to your brand identity. It gives you a lot of good options, but also allow you to edit it. They also show you exactly how your logo will look on a bunch of items that you can then buy from the store. However, you do have to pay for quality service that Tailor Brands gives you. For just the logo, you have to pay $9.99. For the premium services which include a lot of other tools and social media boosters, you have to pay $49.99. If you sign up for a year or two years, it’s a LOT cheaper than paying per month. 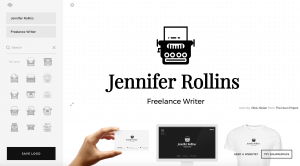 Customize by editing the text and graphic. GraphicSpring is quick. 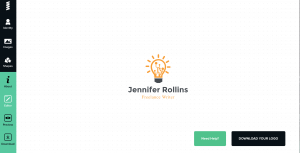 You really can create a logo in a minute or less. It also has a decent amount of designs to choose from. You have a ridiculous amount of options for font, weight, color, and pretty much any other customizations you can think of. You have a lot of control over what your logo turns out to be. However, GraphicSpring does have some drawbacks. While the use of the software is free, the logo is not free. When you save the logo, at this point with watermarks. A high-res version of the logo costs $39.99 and anyone could have used it before, so you might have competing logos out there even after you’ve paid for the rights to use it commercially. Edit the text, font, size, effects, and color. Search for a symbol and select it from the grid. Click symbol to edit color and effects. LogoGarden lets you create a logo very quickly and very easily. It’s simple and effective, though it doesn’t give you as much variety as some of the others. It also doesn’t look quite as professional or clean as some of the others. Browse through thousands of logo icons and pick your favorite. Customized by editing colors, size, and location. 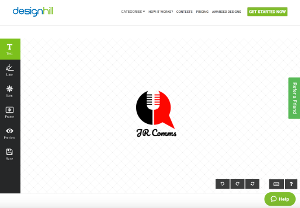 The great thing about Designhill is that it’s actually free, unlike a lot of other supposedly “free” logo design sites. They have customer support 24/7 to walk you through it all. It’s quick, simple, and easy, though there aren’t quite as many icons as some of the other sites. You also don’t have exclusive rights to that icon, so other companies could have a very similar logo. In order to have a customized logo no one else will have, you can pay $99 with a 100% money-back guarantee. There are a couple things to keep in mind as you create your logo. Usage Rights: Make sure you read through all of the terms and conditions on the website to make sure you can use your logo in a commercial setting. TM Violations: Basically, don’t choose a logo that closely resembles another company’s logo, especially one that’s well-established. If it’s too similar, you can get sued for a LOT of money.